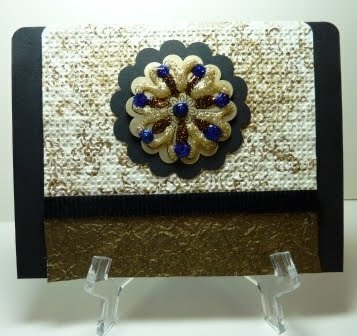 The cardbase is a standard A2 made with Stampin’ Up Basic Black cardstock. The ivory layer is a piece of SU Very Vanilla that’s been stamped with the Bliss stamp in Encore Gold and then overstamped in Soft Suede. Then run it through the Big Shot with the Square Lattice embossing folder to create a fabric look. The crushed gold-look cardstock at the bottom of the card is an unknown piece from my stash – sorry! The black velvet ribbon is from SU (retired). Now for the medallion. I stamped SU Kind Thoughts (retired) image on SU Very Vanilla and punched it out using the 1 3/4″ Scallop Circle XL punch. Then I used three different colors of Stickles (Dark Blue, Cinnamon and Distressed Antique Linen) and traced the pattern. A word of warning – it will take quite a while to dry as there’s a lot of heavy lines and depth to this. Then the medallion was layered onto a larger punched piece – the 2 3/8″ Scallop Circle XL punch.